A dog’s normal body temperature is between 99.5F. and 102.5F. A body temperature over 103° F may indicate the dog has a slight fever. However, a temperature exceeding 105° F. indicates a dog is suffering from heat stroke (hyperthermia), a dangerous condition leading to organ failure and death if not promptly reversed. Nonpyrogenic hyperthermia is the clinical term for heat stroke in dogs caused by excessive exposure to extreme environmental conditions that limit a dog’s ability to release body heat through panting and perspiring via sweat glands in their paw pads. Panting involves evaporation of tongue moisture and facilitating evaporation of a dog’s moist lung linings. Dogs also cool themselves off through vasodilation. Expansion of blood vessels in the face and ears enable blood to flow rapidly just underneath the skin and expedite the exchange of body heat for cooler air. A dog’s foot pads contain the entirety of their sweat glands. Two types of canine sweat glands exist but only one type helps regulate body temperature. The merocrine glands are activated when a dog’s body temperature begins rising. The apocrine glands do not release sweat but secrete pheromones for communicating with other dogs. Upon touching a dog’s sweaty paws, owners may notice they feel cool, clammy and slightly greasy. Sweaty foot pads may also leave a noticeable mark on certain surfaces. Dogs left in cars, with or without the windows down, is the leading cause of heat exhaustion and heat stroke in dogs. One study found that the temperature inside a vehicle can rise nearly 19°F in 10 minutes and 34 °F in 30 minutes when the sun is shining and the outside temperature is above 40°F. Another study showed that vehicles with “cracked” windows and “closed” windows reach similar internal temperatures in one hour, indicating that cracking a window does nothing to cool off the interior of a vehicle. Remember that dogs do not have the number of sweat glands humans have to help maintain normal body temperature. 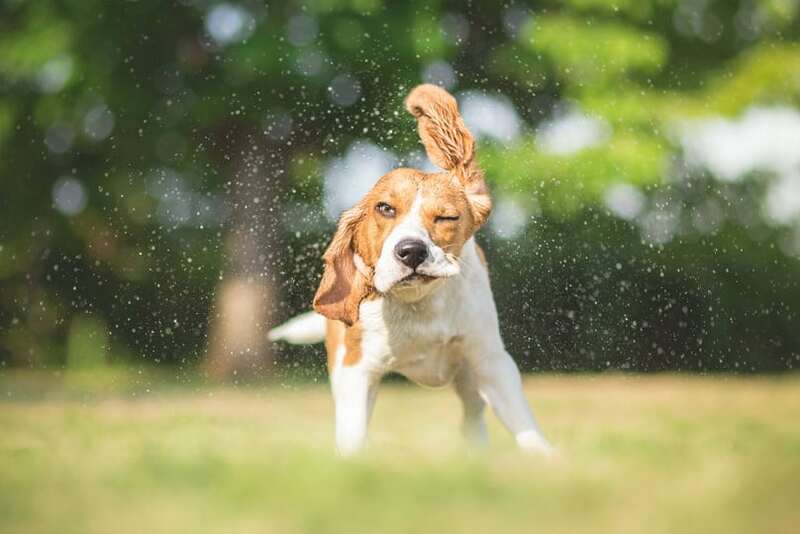 Owners walking their dogs or playing with their dogs outside may not feel overheated in warm weather but their dog’s internal body temperature could be rising rapidly. In addition, some dog breeds are prone to suffering heat stroke. Brachycephalic dogs, or dogs with pushed-in noses like Yorkshire terriers, Pugs, Pekingese and Shih Tzus, cannot breathe as well as other dogs, making it harder for them to cool off by panting. Heavy panting in brachycephalic dogs may also cause swelling of air passages that contribute to respiratory distress during the early stages of heat stroke. Just because dogs can lie down outside or go inside a doghouse doesn’t mean they can’t suffer from heatstroke. Inactive dogs exposed to hours of sunlight and hot air experience body temperature increases the same as they would if they were being physically active in the same kind of environment. Never leave dogs outside when it is very hot and humid, even if they have access to shade. What Happens to a Dog’s Body During Heat Stroke? As a dog’s body temperature nears heat stroke level, proteins and enzymes in blood and tissue start breaking down, cellular membranes deteriorate rapidly and the body cannot continue producing energy. Continuing degradation of tissues, development of tiny blood clots and failure of the liver and kidneys to rid the bloodstream of toxins contributes to a dog’s declining condition during heat stroke. The dog’s heart beats too rapidly for too long as it tries to cool off the body, causing dizziness and fainting. Sensitive to heat, the canine central nervous system succumbs to internal body temperatures reaching 105°F or more as the overheated dog becomes agitated, confused and quickly loses consciousness. Without treatment, a dog suffering heat stroke could die within minutes of developing symptoms. Whether conscious or unconscious, a dog suffering heat stroke must be moved to a cooler environment immediately. If possible, place the dog in a bathtub and run cool (not cold or tepid) water over his body, making sure water does not enter his mouth or nose. Allow the bathtub to fill up with water so that the neck and back of the dog’s head are covered. Keep the dog’s head elevated as the water lowers his body temperature. When a bathtub isn’t available, use a hose to cool an overheated dog. Placing a cold pack (a plastic bag full of ice or a bag of frozen packaged food) on the dog’s head helps reduce body temperature more quickly. Massage the dog’s legs and shoulders to stimulate circulation of cooler blood. Massaging a dog suffering heat stroke also reduces the risk of the dog going into shock. Wrapping overheated dogs in cool, damp towels and placing them in front of fans will help reduce core body temperatures. Gently rubbing isopropyl alcohol on the dog’s groin, under the front legs, and on foot pads also facilitates cooling off a dog suffering heat stroke. After the dog recuperates from heat stroke, let him drink as much water as he wants to drink. Add a half-teaspoon of salt to the water to expedite replacement of minerals lost through pad-sweating and panting. Offer ice cubes to dogs that may not want to drink. Licking ice cubes can sometimes encourage dogs to drink water. Never use ice water to cool off a dog suffering symptoms of heat stroke. Very cold water causes surface blood vessels to constrict and interfere with the dissipation of heat from the body. Never allow a dog to shiver while you are reducing his body temperature. Shivering just creates more internal heat and overworks the dog’s already weakened muscles. Also, avoid cooling an overheated dog too rapidly. Gradually lowering a dog’s temperature allows all physiological systems to slowly return to normal functioning. Use your thumb and index finger to gently lift and press together a small section of your dog’s skin. If the skin remains stuck together (loss of elasticity) and doesn’t immediately return to its normal position, this could be a sign of dehydration in dogs. If you notice signs of dog dehydration in your pet, give him a small bowl of fresh, cool water and then take him to your veterinarian as soon as possible. Don’t let him drink too fast or gulp down large amounts of water, especially if he is moderate to severely dehydrated. He’ll probably just vomit the water and suffer stomach cramping. For mild to moderate dog dehydration, your vet may recommend giving your dog a mixture of water and electrolytes, which replace vital nutrients (especially potassium, calcium, and sodium) lost due to dehydration, You can make your own electrolyte-rich water by combining one quart of purified water, one teaspoon of salt and one tablespoon of sugar or honey. Severe cases of dog dehydration demand immediate administration of fluids intravenously to replenish the dog’s body fluids. Dehydrated dogs close to shock may need to stay at the vet’s for several days before the dog is healthy enough to be released. Getting immediate veterinary attention is essential for a dog’s successful recovery from heat stroke. 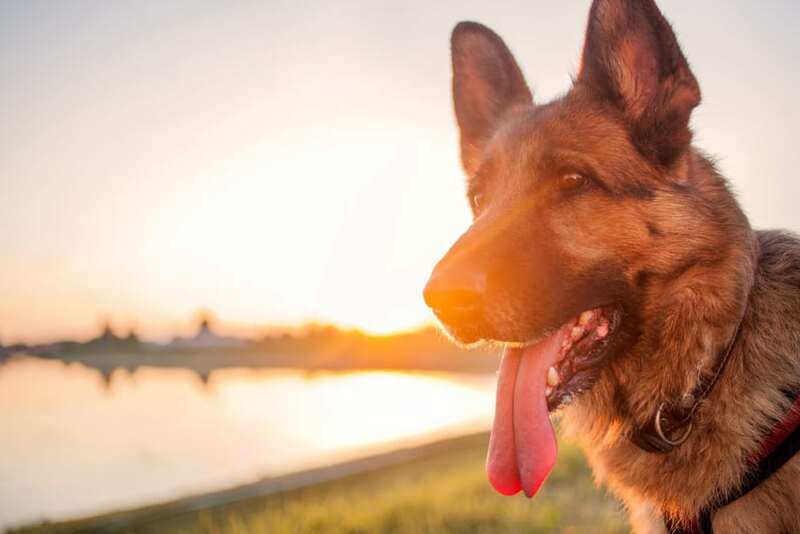 Although a dog may seem to have fully recuperated from an episode of severe heat exhaustion, internal medical problems may continue worsening that does not affect the dog’s current health condition. Lingering effects of heat stroke include brain swelling, kidney damage/failure, abnormal blood clotting and damage to vision or hearing. Dogs may require hospitalization for a few days while they recover from heat stroke. Oxygen supplementation, intravenous feedings or special diets may be prescribed to replenish the dog’s body with the nutrients it needs to restore good health. Veterinarians caring for a dog with heat stroke may conduct several lab tests, such as blood tests to measure total proteins, blood sugar, electrolytes and coagulation factors. Complete blood counts, blood gas analysis, blood smears and urinalyses are used to determine if the dog is suffering from organ damage and/or severe dehydration. Heat stroke significantly increases metabolic demands within the dog’s body that rapidly depletes stores of blood glucose (sugar). Liver dysfunction can also inhibit glucose production, which causes recovering dogs to develop hypoglycemia (low blood sugar). A serious type of blood infection called sepsis may also contribute to low blood sugar. To restore normal glucose levels, veterinarians may give dogs IV solutions for several days, along with providing the dog with a diet modified to induce glucose production. Depending on how long a dog experienced heat stroke symptoms, blood gas analysis results will show how much carbon dioxide has accumulated in the blood. The more CO2, the longer the dog suffers from heatstroke. Kidney failure also contributes to an abnormal gas analysis. Complete blood counts tell veterinarians whether the dog is suffering severe dehydration, anemia, thrombocytopenia (low blood platelet count) or leukopenia (low white blood cell count). Blood smears detect evidence of schistocytes in the blood, nucleated red blood cells indicating heat damage to bone marrow that forces a premature release of abnormal red blood cells. Thick-coated dogs living in hot climates should have their coats kept trimmed and short to reduce their risk of heat-related diseases. Additionally, dog owners should avoid putting shirts or booties on dogs in warm weather. Booties interfere with the ability of dog paw pads to perspire freely and cool off a dog’s body. Limit your dog’s physical activity outdoors on hot, humid days. Adjust the duration and intensity of your dog’s outdoor activities according to the “real-feel” temperature, not the actual temperature. Always keep fresh water available inside and outside. Take along a bottle of water and bowl when you are walking your dog in warm weather. Walk your dog in the morning or evening during hot weather for a more refreshing outdoor time. When temperatures approach 80 degrees F. and humidity are above 60 percent, don’t leave your dog outside for over 15 minutes even if the shade is accessible. 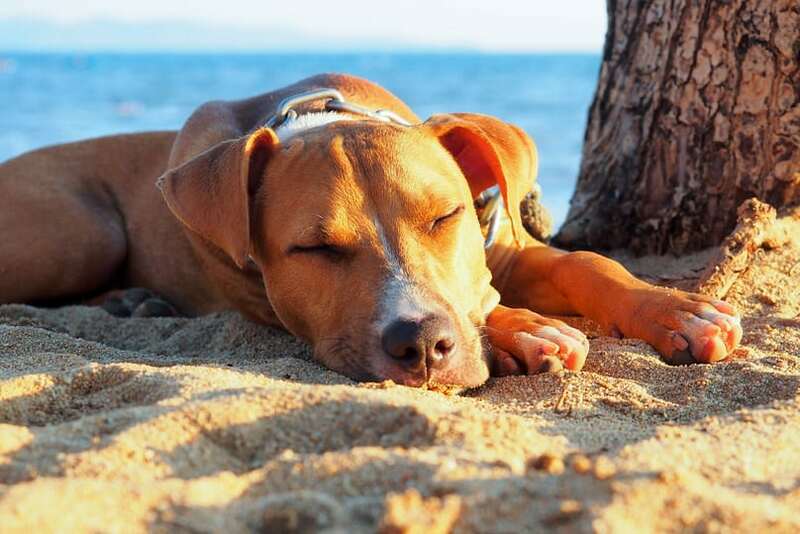 Sometimes, dogs may suffer an underlying disease their owners are unaware of which causes heat exhaustion or heat stroke to occur rapidly and without warning. To encourage dogs to drink water in the summer, clean their water bowl every time you refill it to avoid a slimy buildup in the bowl that makes water taste flat and bitter. Also, give dogs two cans of wet food daily to ensure they are receiving enough water. Because wet food contains 70 percent water, dogs receiving two or more cans of wet food daily may not drink as much water as dogs that eat mostly dry food. Dogs not groomed regularly may be vulnerable to suffering heat exhaustion in warm weather as well as parasitic infestations, ear infections, skin infections and paw pain or deformity caused by overly long nails. Grooming also helps decrease shedding by removing dead fur and stimulating skin oil production. This promotes the growth of new, healthy fur that is less prone to dryness and falling out. A professional grooming session should also involve trimming hair around the face to reduce the risk of stray hairs irritating eyes and causing infection when longer hairs transfer debris and bacteria into the dog’s eyes. Do not give your dog any food 12 hours before surgery. Most surgeries are scheduled during morning hours so dogs can eat a good dinner before settling down at night. You can give your dog a small bowl of water in the morning if they are thirsty. Before taking dogs to the veterinarian, take them for a short walk so they can relieve themselves. After the surgery is complete, veterinarians will closely observe dogs that come out of anesthesia. Dogs may need to remain one or two days at an animal hospital for observation. Dogs having surgery following a heat stroke episode will only be released when their vet knows for certain they are well enough to return home. Post-surgery care also involves owners making sure their dog receives medications as directed, keeping bandages clean and dry, ensuring they get plenty of rest and monitoring incision sites for possible signs of infection. Your dog may not want to eat normally upon returning home but should get his appetite back within 24 hours. If you don’t think your dog is eating enough after surgery or is exhibiting signs of distress, contact the veterinarian as soon as possible. Dogs should never have to suffer from heat stroke. It is an entirely preventable condition involving owners making sure they do not leave their dog outside on hot, humid days. Even on temperature days, dogs should have constant access to shade and fresh water. Recognizing symptoms of heat stroke immediately is essential to saving a dog’s life. If you know a dog has been exposed to heat for too long, examine the dog carefully. Is the dog panting heavily? Is the dog’s tongue white and pasty? Are the dog’s eyes bloodshot? Can the dog stand up or is he unable to get to his feet? If you think a dog is suffering heat stroke, cool him off immediately by placing the dog in a bathtub and running cool (not cold) water over his body. Use a garden hose if no bathtub is readily available. Let the dog drink as much water as he wants. However, NEVER pour ice water over an overheated dog. The shock to his system could do more damage than heat exhaustion. Finally, take the dog to a veterinarian as soon as possible. The vet will continue cooling the dog off, monitor his vitals and provide supportive care until the dog is well enough to be sent home. Sometimes, a dog recovering from heat stroke may need to remain at the veterinarian’s overnight for further monitoring. Dogs recovering from heat stroke should be provided with nutritional food and all the fresh water they want while recovering. Keep a dog recovering from heat stroke inside for a few days and watch for signs of illness such as appetite loss, continuing lethargy, diarrhea and general unwellness. Although a dog may be drinking water, he could still be suffering from heat stroke-related dehydration requiring veterinary attention.